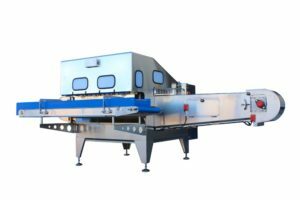 The Turatti Group proposes Streamer, a machine designed to automatically obtain a wide range of spiralized products, with different shapes and sizes. Vegetables and fruits are fed into a loading system, where they are held before being conveyed to the cutting station (seamless operation), consisting of a series of multiple cutting heads, each one equipped with a centering device allowing the creation of uniform and regular spiral slices from firm fruits and vegetables. Different shapes can be made, as spaghetti, tagliatelle, ribbons, from carrots, zucchini, cucumbers, broccoli or squash. The cutter is designed for easy operation and hygiene, with all the necessary protection for safe operation. The main advantages of the system are: combined high cutting capacity and quality next to high versatility; recovery of otherwise unused product parts (stalks, cores, irregular products); continuous operation with different products; uniform cut, adjustable according to the needs.